Viaggia in una terra da fiaba di mulini a vento, case di legno e negozi di formaggi in questo tour privato di mezza giornata a Zaanse Schans da Amsterdam. Visita il tradizionale villaggio olandese per dare uno sguardo alla scena dei mestieri del Vecchio Mondo e all'affascinante atmosfera, e poi planare sui numerosi mulini a vento che costeggiano le rive del fiume Zaan in una gita in barca privata. Fermati a pranzo nella città di Zaandam, e ascolta storie sulla vita sul fiume da uno skipper e una guida amichevoli. We have a wonderful day - everyone from the tour group really made this tour great. They picked us up and brought us to meet our guide (Toots) at Zaanse Schans which is so unique...wooden houses, mills, barns and workshops. Then we went on a boat ride on the River Zaan, the boat captain was great and pointed out so many things for us to see. After the boat ride, he took us to a restaurant to have a Dutch Pancake lunch. This was lovely, food was so good and they made up the small pancakes for dessert! They picked us up and brought us back to the apartment. We had no worries, everything was taken care of and we just had a ball! This private tour exceeded our expectations in every way. If you want to see the true culture of old Holland and the real windmills this is the tour for you. The guide was extremely knowledgeable in all aspects of the culture back than. She did not read off a prepared sheet of tour items or hesitate on answers to questions we asked about life and living conditions back in the 1700's. She took us to buildings that were not open to the general public or group tours. The guide was very observant of our slow walking and us trying to take in as much of the sights and scenery as we could and did not hurray us along or pressure us to move on like most tour guides. This is rare to find in the tour industry. I would recommend this tour to anyone who would like to immerse your self in the history and culture of the past. 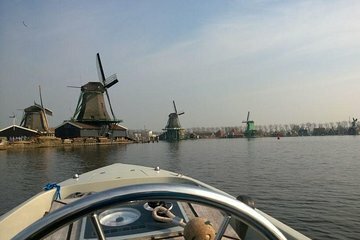 Bart took us on an amazing, not rushed, private adventure where we experienced the beauty of old Holland's windmills, old towns, cheese and clog making as well as a great tour of the river. Very informative and not rushed at all! Highly recommended if you have little ones! Bart was wonderful! We had a great time and he was very informative and polite. The weather was perfect which was an added blessing. If you go with Bart you'll have a great time. Bart showed up on time to pick us up with his minivan. He was very friendly and relaxed throughout the trip, very flexible and accommodating. Because of his reasonable prices we were able to take this private tour, and we enjoyed it very much.